Most international flights to Morocco from Europe and North America fly daily into Casablanca, where they connect with frequent daily internal flights to Marrakech. British Airways has a daily direct service from London and Manchester to Marrakech, and Royal Air Maroc has daily flights between London and Marrakech. Starting 31 October, 2006, Ryanair will be offering direct flights from London to Marrakech four times a week. There are also daily direct flights between Paris and Marrakech with Air France and Royal Air Maroc. From Marrakech airport, it is a 15-minute complimentary transfer to Amanjena. A car transfer may be arranged between Casablanca airport and Amanjena for Dhs 2,500 + 10% per car per way. This takes approximately 2.5 hours. Amanjena is a unique luxury resort located just outside of Marrakesh in Morocco. The name “Amanjena” means peaceful paradise and the resort is a sun paled red – similar to the city itself which is also named Al Medina al-Hamra meaning the city of red. The pise-walled resort is covered with Moresque arches from the entranceways to the fireplaces. The Entrance Colonnade leads through court yards and fountains which are strewn with rose petals. Flowing water is considered a gift in this desert country, a symbol of grace and abundance. There are two fireplace lounges on either side of the Entrance Colonnade- both with 2 metre hire brass lanterns. Each lantern rises from a circular banquette made of velvet. The restaurant offers the epitome in luxury and elegance with onyx columns, a retractable sky light and a rose petal marble fountain. The menu offers Moroccan and Mediterranean cuisine. At Amanjena, there is also a Thai restaurant which is just as beautiful with bright glass doors and coral-tadlekt walls. Private dining may also be arranged for guests in the pavilions or maisons. The resort houses an outdoor heated swimming pool with hand-cut glazed green tiles. From the pool-side, relaxing on your chaise longue, you can take in views of the olive orchard, resort canals, golf course or the Pool Terrace. You may enjoy breakfast, lunch, Moroccan Mint Tea or a variety of other refreshments without ever leaving the pool side. For the guest accommodation, there are 32 pavilions – 8 of which have their own private pool. Each has a wood burning fire place, a bathroom with Moroccan marble and a stepped and columned bath tub. They also have local berber carpets which cover zellij-tiled floors. For more information please refer to side menu. Amanjena is shaped by a Kingdom, past and present, by royal design and elemental grace, by the symbols and smells, the colours, echoes and reflections of Marrakech. At luxury resort Amanjena, there is a magnificent two storey library that is lit by ceiling lanterns and natural light which filters through windows at varying heights. It has a six metre ceiling and fireplace and there is also a balcony that runs right around the room’s perimeter. In the library, one can find books, magazines, newspapers, board games, CD’s and DVDs. There is also a variety of drawing materials available here such as water colours, inks, acrylics, oils and canvases. Amanjena does of course have a Health and Beauty Centre which offers two hammams or steam baths and a glassed-in whirlpool. After a traditional Moroccan gommage, enjoy a massage in one of the treatment rooms. 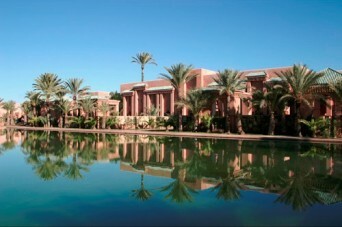 Within the luxury resort Amanjena, there are three boutique shops for the guests. These are located within the cedar-ceiling colonnade that follows the swimming pool. The shops house exclusive objects including a good selection of Moroccan arts and handicrafts, jewelry, brass lanterns, pottery and antiques. All linens including shawls, tablecloths, and caftans are hand-woven locally. There are also two clay tennis courts which can be lit for night-time playing – both courts have minzahs at both ends for drinks and breaks.